I feel kind of betrayed right now! I've been making homemade laundry detergent on and off for over 10 years now. I dutifully bought my Fels Naptha soap thinking it was the best option for laundry soap. I JUST bought a new 4-pack of bars last week. As I was unwrapping a bar recently to make a new batch, I read the ingredients (I have no idea why I've never read it before!) I was extremely disappointed to realize that the soap contains an ingredient that I've really been trying to stay away from~~ triclocarbon. Unsure if it was related to triclosan, I set off on my internet journey to find out. It sounds like it has effects that are similar to triclosan. I am so disappointed that I didn't know that the soap contains this ingredient. It also contains two fake dyes and a fragrance. So much for my attempts to make something that would be healthier for my family. While I was out searching the internet, I ran across another homemade laundry soap recipe from TJ at Measuring Flower. I actually go to her blog once a week to list my giveaways, so I'm happy to be able to share one of her posts with you. I'm happy that I found the new recipe and will try her recipe out as soon as I make another batch. She makes her recipe without Borax, too. After researching a little more online, I think that I'll still use my Borax. I might just try to find a better soap to use, but at least there are more options, right?!? Have you ever tried to make your own laundry soap. 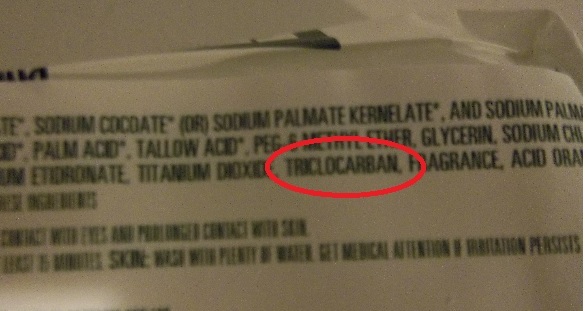 Labels: homemade laundry soap, why is there triclocarbon?! ?